Yumbo Centre, in the heart of Playa del Ingles does not offer fine dining in charming or beautiful surroundings. This is reflected in most of the food served in the restaurants there, as in Restaurant Ola where we dined one warm February evening. The service, however, was much better and in spite of the food being bland and uninteresting we were entertained by a charming waiter that made our meal worthwhile. There are little charm found in the Yumbo centre. It is basically several levels built around a central courtyard in the middle of Playa del Ingles. Here you find a number of restaurants, souvenir shops, and a large number of gay, mixed and straight bars. On one of the lower levels you find Restaurante Ola, serving Northern European / German cuisine to tourists seeking heat and sun during cold winter months. 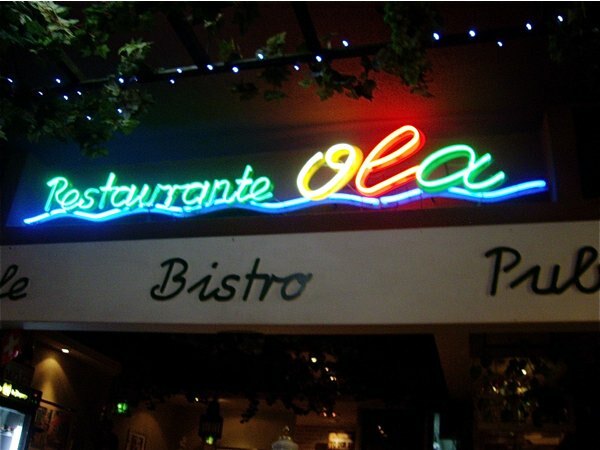 We had already dined at several restaurants, without being impressed by the quality of the food, and Ola Restaurant followed the general pattern. 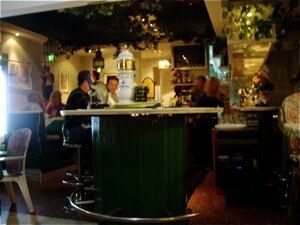 As most other restaurants and bars at the centre, very little effort had been made to create a cozy interior. Our table was however well dressed with napkin, plates and forks, and it was good distance to neighbouring tables providing good comfort for us during our meal. We found the service at Ola to be very good. We were waited by a young man that attended to our needs as well as providing some wit during our meal. We ordered swiftly and were served our food without delay. I ordered tomato soup as starter and wiener schnitzel with Bearnaise sauce main course. 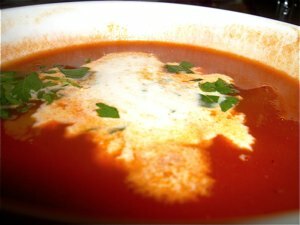 The soup was served with a large dash of sour cream, deep red and very (too) smooth. My question was whether it was home made or a product of a can or soup base. Sadly, as with many tomato soups or sauces, the acidity of the tomatoes was not properly balanced. It was sour, slightly bitter out of lack of sugar. The Wiener schnitzel was served with rice, asparagus and vegetables. The cauliflower was slightly under cooked and the meat and sauce did not taste very much. It reminded me, strangely enough, of another schnitzel served at Den Danske Kro. The meat served there was definitely better than the Ola, but the sauce was just the same. Same supplier? In that case, find another. 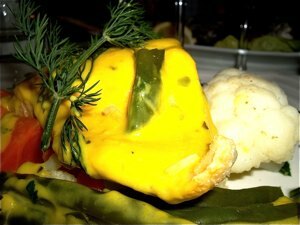 There is no things more depressing than a tasteless Bearnaise sauce. Restaurant Ola was nothing to brag of, neither atmosphere nor food, but the staff did as good as they could. Restaurant Ola is hardly the venue for a romantic dinner. Españoles NO VAYAN A ESTE RESTAURANTE !!!! Les comento lo que me pasó. Fui con mi marido, mi suegra y una niña discapacitada amiga nuestra a ver el espectaculo de los Drag Queen, en el Yumbo de Playa del Inglés. Como estaba todo lleno, nos paramos en el pasillo que esta delante de este restaurante, porque había otras personas, la mayoría extranjeros.En eso sale una señora con un marcado acento Francés, y nos empieza a gritar que nos vayamos. Como es lógico le decimos que no estamos haciendo nada malo, que estamos mirando el show en un espacio público, a lo que nos contesta que siempre pasa lo mismo con los Españoles, que son una mierda, y que no cuidamos el turismo. Mi marido le contesta que gracias a los Españoles está comiendo, se rie y dice que es mentira, y llama a otro tío que se pone a hablar por el movíl cerca nuestro llamando a alguien y diciéndole que se acerquen que hay problemas. LLegan dos matones, de más de 1.90 de altura, con faldas escocesas, y se me ponen detrás, empujándome, y fumando, tirándome el humo en la cara a mi y a la chica discapacitada.Para no tener problemas nos tuvimos que ir, porque la verdad ya tenía miedo, que le terminaran dando una paliza a mi marido por defendernos. Solo eso, compartir los que nos pasó, para que este tipo de gente no prospere a costa nuestra. Aclaro que sólo se metieron con nosotros porque somos Españoles, a los demás nunca se dirigieron.